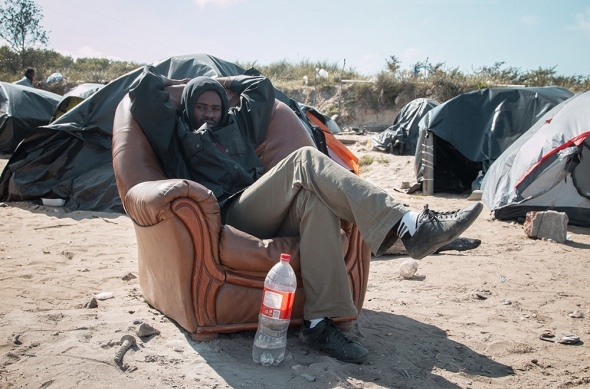 James Rippingale talks about taking photos of life in the refugee camps in Calais. I first read about Calais in September 2014. I was in a café waiting to meet photographer Henry Wilkins. An old copy of British newspaper The Sun was on the table, with an article about African ‘migrants’ trying to get over fences in Calais. The article did not talk about the migrants in a positive tone. And there was not much reporting about Calais. So, a few days later, we went on the ferry with a tent, an old camera and a simple photo studio, to try to show the personal stories of people camped in Calais. We wanted to find out why, every night, groups of men risked death, drowning, broken legs, suffocation and violence by French police, to try to reach England. Half an hour after we went in the ‘Jungle de Tioxide’ (now evacuated), we started hearing the refugees’ stories. And we soon found out that police violence was nothing compared to the terrible things the people had experienced, in their country and on their journey here. In Sudan, government intelligence agents broke Yassen’s legs and beat him for days because he protested against low wages in Khartoum. Mohammed was tortured with farm equipment. Whalid was covered in ice-cold water and electrocuted because he refused to change religions and become Muslim. Ahmed has an MA in Agriculture and Food Security from the University of Khartoum. Sudanese police stabbed him because he was working with poor farmers in Sudan. 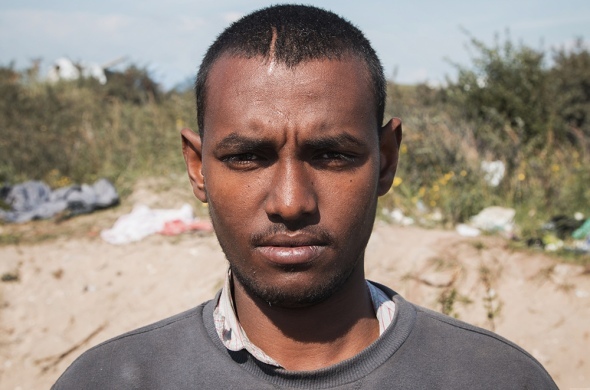 Muhammad was hit with barbed wire and forced to join the Eritrean army when he was 14. All of these terrible things happened before the men had started to walk across the 5,000 km of desert. They walked through bombed cities and villages where there had been genocide and ethnic cleansing. 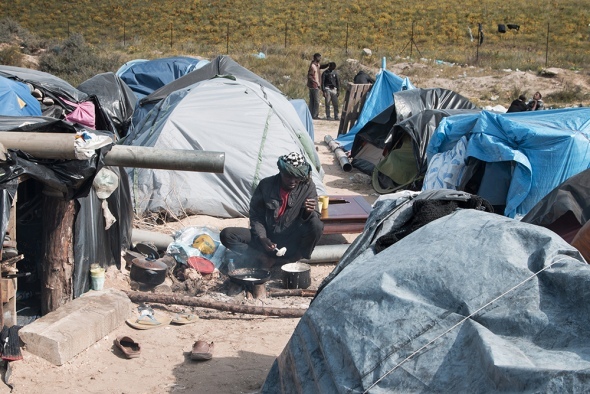 When they got to Calais, the only things they saw was dirt and rubbish, simple old tents and dying fires in an old chemical-processing plant a few kilometres from the port. Then, many people living in The Jungle were optimistic. They thought they would one day reach England and begin new lives. They were happy and interested to see us, as we took photos and interviewed. But it was difficult to get them to trust us and agree for us to take photos of them. It’s more difficult taking photos in Calais today, for different reasons. On our first visit, many people there – particularly those from Sudan and Eritrea – said they are afraid of their governments seeing their name or face in international media. Many were afraid that their family, back in their country, would be killed, tortured, or sent to prison. This fear was real, so we worked sensitively to help communicate the crisis. The people we took photos of all came from families with no relatives in their countries. Their families had all died – not of old age. Henry and I visited Calais several times in 2014. And when we returned as independent journalists in January 2015, the mood was very different. We wanted to write about the opening of the Jules Ferry Centre – a permanent place for migrants, where French riot police moved people from The Jungle. It was more difficult working and taking photos. People were desperate. Everything had started to break down. Now, people weren’t happy to see us: they were angry because newspapers in England and in France kept telling people they were bad. British newspapers like the Daily Mail showed the refugees as a terrible disease, only a few kilometres away, coming to England. The newspapers said they were violent, irrational, and there were too many of them. So they thought all journalists were guilty. Sometimes when we took out a camera, angry groups screamed, threatened us or chased us away. The problems with reporting on Calais are not as obvious as the problems people have working in war zones. But it was easy for the newspapers to get there, because it is near England. Inside the Fort Galloo squat - my photos are almost the only ones there are - I was threatened many times. Another colleague who came with us was nearly attacked outside the Jules Ferry Centre. Many refugees thought our cameras were there to do them harm. Refugees – good or bad? Recently, the newspapers have been talking about the refugees in a more positive way – one minute they think the refugees are victims, then the next minute they think they are evil. Journalists like Owen Jones is doing a good job to show the true situation. But many refugees just want all the reporters to go away. Then the media showed the photo of the drowned body of 3-year-old Syrian refugee Aylan Kurdi on the Greek island of Kos. And after one photo, more than 400,000 people signed a petition to make the British government accept more refugees into the country. In reality, refugees are not victims or evil people: they are simply people. They are people whose fathers, mothers, uncles, brothers and sisters have been killed; people who have left their family alone in very difficult situation, hoping that they can bring them to safety after they get to England. There is only one thing that separates them from us: they desperately want to survive. Most people now accept that these people don’t want to be in Calais. But the truth is simpler. They don’t want to be in England. They want to be in their own countries, in their own fields and farms, cafés and streets, in their own culture. But when you can be attacked with a machete in your head when walking to the local market; or when you employ a Christian to work in your Khartoum corner-shop and your own government ties you up and beats you with electrical cables; or when you visit your family and see where they were burned alive, there’s really not much choice, is there? Why England? I have talked to many people camped in Calais. They have told me they want to come here because England is strong, safe and secure - not because they want to take advantage of our benefits systems, healthcare, opportunities, work or money. Of course, England is also the country that bombed Libya to get rid of Colonel Qadafi. Also, England went into Afghanistan, filling it with landmines, helicopters and destruction, but promising peace and stability. England also colonized places like Sudan and Eritrea, changing them completely. But so far England’s only solution to the crisis is to tighten its borders. Now there are more refugees and asylum-seekers than ever - one in every 122 people is a refugee, internally displaced, or seeking asylum. They must think again. 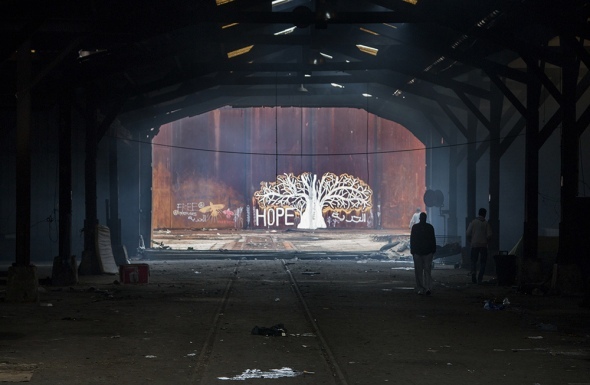 The refugees in Calais are more than just a photo on Facebook. In 6 months, they have doubled in number, desperate to come in our country. And they are not going away. David Cameron has recently promised to take 20,000 Syrian refugees by 2020. But this is not enough. This is not just a crisis of ‘migrants’ or migration. It is a long, painful story of global conflict and suffering and our place as a country in this story. It is time to accept that the refugees’ story is our story, too. We need to face up to what we helped create. 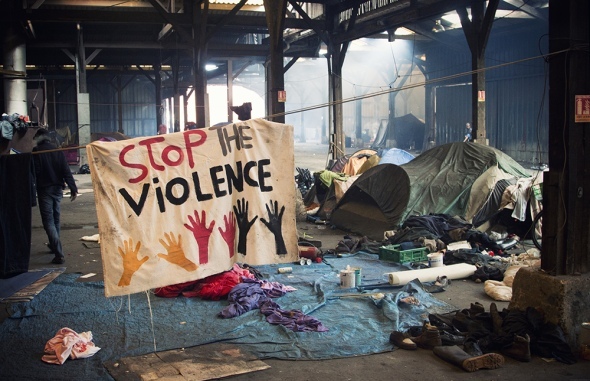 NOW READ THE ORIGINAL: http://newint.org/features/web-exclusive/2015/09/09/refugee-crisis-calais/ (This article has been simplified so the words, text structure and quotes may have been changed). This page was last edited on 10 September 2015, at 19:08.